With dozens of domestic titles won, and being by far the most successful Greek team in UEFA competitions, Panathinaikos are considered one of the two biggest clubs in the country. They are also one of the oldest, having been founded in 1908. Apostolos Nikolaidis Stadium, the historic home of Panathinaikos. “Panathinaikos” means “Panathenian”, (Pan-Athenian, “of all Athens”), and is how the club have been called since 1924. The original name was “Ποδοσφαιρικός Όμιλος Αθηνών”, (pronounced Podosferikos Omilos Athinon, “Football Club of Athens”), and appears to be the first football-specific club in Greece. The full name of the club in Greek is Panathinaikos Athlitikos Omilos (Athletic Club, not Football Club, which is used in the English name), and are usually called simply either Panathinaikos or PAO (from the initials of the three words). Affectionately, they are called either “Trifylli” (clover, the emblem of the club), or “The Greens”, since green is their main color, chosen as a symbol of youth, hope and growth. Actually, in the first two years of their existence the team wore red and white, which in modern times looks ironic, since red is the color heavily associated with Panathinaikos' bitter rivals, Olympiacos. 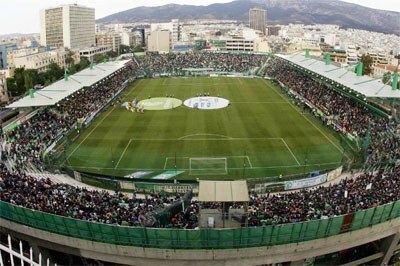 Panathinaikos are the biggest team in Greece's capital city, Athens, with AEK being their biggest city rivals. It's their derbies against Olympiacos though (from adjacent Piraeus; there is no physical boundary between the two cities) that attract the biggest attention in Greece every year. They are called “the derbies of the eternal rivals”. The Greens have won the championship title in Greece way less times than Olympiacos, but they have been far more successful than them in UEFA competitions. In 1971 they reached the final of the European Cup (later rebranded and renamed to the UEFA Champions League), losing 2-0 to almighty Ajax at Wembley. They have also reached the semifinals on two occasions, first in 1985 (got eliminated by Liverpool despite beating them 1-0 in Athens), and then again in 1996, when fate brought Ajax again on their path. Panathinaikos earned a massive 1-0 victory in Amsterdam in the first leg, with Polish legend Krzysztof Warzycha scoring one of his almost 300 goals for the club. The return leg was a very different story though, with Ajax totally outplaying the Greek side, to win 3-0 in Athens. Panathinaikos have also reached the quarterfinals of the biggest club competition in Europe on two occasions, plus, they have recorded two presences in the last 8 of the UEFA Cup (predecessor of the UEFA Europa League). Warzycha is the club's all-time leading scorer, having spent an amazing 15-year period wearing the green and white jersey. He is not the only Polish though to have associated his name with Panathinaikos. Goalkeeper Józef Wandzik spent all the of 90s in Athens, linking his name with many glorious moments for the club. Then, there are coaches Kazimierz Górski, an emblematic figure of Polish football, as well as Jacek Gmoch, probably the most popular Polish in Greece, with friends at every single club he worked at. The only Polish sportsman who can compare to Gmoch in popularity in the country is Warzycha, who, all those years he spent in Greece, impressed not only with his scoring talent, but also with his work ethic and overall behavior. Another Central-Eastern European who has written his name in golden letters in Panathinaikos' history is Hungarian legend Ferenc Puskás, coach of the team from 1970 to 1974. He is the one who led the Greens to Wembley's final against Ajax in 1971. Panathinaikos have always contributed a great deal of players to the Greek national team, but legendary striker Antonis Antoniadis and iconic number 10 Mimis Domazos are a step above all else. The latter holds the record of appearances for the club, having played in 504 games in the Greek championship alone. The team's historic home is Apostolos Nikolaidis Stadium, named after a former president, one of the club's most prominent figures. It was Athens' Olympic Stadium though that hosted Panathinaikos' epic European Cup matches from 1984 to 2000, a stadium able to host more than 70,000 fans, often full in European matches. Weird as it may seem, maybe, to outsiders, the biggest stadium in Greece never won the hearts of Panathinaikos fans, who were happy, most of them, to see the team return to Apostolos Nikolaidis, or “Leoforos”, as it's affectionately called. Leoforos is Greek for “avenue”, the stadium is built along Alexandras Avenue, hence the nickname. Titles-aside, Panathinaikos are considered the first truly “European” club of Greece, in the sense that their organizational structure was much more “Western European-like” in decades (70s, 80s) that things at other clubs in Greece were done is less professional ways. Panathinaikos, through their successes at international level, had come in close contact with the biggest clubs of those two decades, learning from them, and gradually building an institution by real European standards, having as well the financial muscles to do that. Yorgos Vardinogiannis, member of one of Greece's most powerful families, was the owner of the club for over two decades (from 1979 until 2000), overlooking the transformation of Panathinaikos from a big team in Greece, to a power to be reckoned with at international level. Sadly for Panathinaikos, his successors in the first part of the 21st century have proved unable to maintain the club at the same high standards, both on and off the field (with just a few notable exceptions, the doubles won in 2004 and 2010). The emblem of Panathinaikos since 1918, ten years after the club were founded, has been a shamrock, also called clover and trefoil, with the latter being the closest to “τριφύλλι” (pronounced “trifylli”), which is how it's written in Greek. It was chosen as a symbol of unity, balance, and good luck. The crest was changed in 1995 to include the word “ΠΑΝΑΘΗΝΑΪΚΟΣ” (Panathinaikos) in big letters (before that, it was much less visible), the founding year (1908), and two small green stars.